Join Kagan for this special opportunity at Kagan's headquarters in San Clemente, CA. This engaging institute is regularly priced at $349. 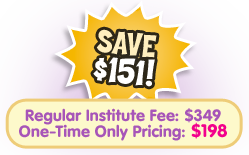 For this institute only, you can attend for only $198. This special discount is Kagan's way of saying thank you, and giving back to our local community. Motivate and reach your most reluctant learners with interactive strategies that work! Especially powerful for secondary and elementary teachers who want to increase engagement, boost test scores, and reduce the achievement gap. You'll build powerful learning teams in your classroom and use the Kagan methods for team formation, teambuilding, classbuilding, management, thinking skills, presentation skills, decision making, communication skills, and social skills. You'll leave with a toolbox full of Kagan Structures, proven strategies that are easy to use tomorrow and for a lifetime. Discounted lodging for our San Clemente workshop participants! Special price of $109 per night plus tax if you mention Kagan when calling for reservations. Or click here to book your room.